On Tuesday Goldman Sachs defended itself against charges of government civil fraud. One executive claimed the band “would never intentionally mislead anyone.” The amazing surge in profit of Goldman Sachs has been severely diminished because of the legal proceedings. 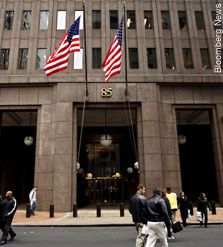 As a leading Wall Street bank Goldman Sachs reported doubled first quarter earnings. In the meantime the Goldman Sachs Group Inc. had executives on conference calls with industry analysts and reporters on Tuesday discussing the Securities and Exchange Commission’s civil fraud charges instead of earnings. Goldman Sachs has also come under scrutiny on the other side of the pond as well. Britain’s financial regulator began an investigation into the International branch of Goldman Sachs. The Prime Minister Gordon Brown accused Goldman of moral bankruptcy for the plan to pay large employee bonuses despite the charges that have been brought against the bank. These charges stem from a 2007 transaction that analysts claim helped accelerate the recession. Government representatives claim that Goldman Sachs did not inform two clients that they CDO’s (collateral debt obligations) that they purchased were put together partially by John Paulson the billionaire hedge fund manager who was betting on them to fail. Goldman Sachs isn’t the only large bank to be criticized under the Obama administration for accepting bailout money and then paying large bonuses to employees. In the case of the charges of government civil fraud representatives of Goldman Sachs maintain that the SEC’s claims are false and that Paulson had no hand in selecting the securities in question. Goldman calls the charges “unfounded” and plans to “vigorously contest” them. After such a promising first quarter Goldman Sachs stock has plummeted as investors have become aware of the investigation and charges. In the earnings report for the first quarter Goldman Sachs said it placed approximately $5.5 billion aside for employee salaries and bonuses, this is 17% more than allocated for the first quarter of last year. Goldman Sachs announced Tuesday that the executive Fabrice Tourre who was named in the SEC lawsuit is taking a “break” from his duties. CFO for Goldman Sachs, David Viniar told analysts that the bank lost more than $100 million on the transactions in question including fees and expenses. Analysts speculate that the lost money on this deal occurred due to Goldman being unable to sell the position before the value dropped. When asked about that a representative did acknowledge that the bank did try to find a buyer. This investigation holds the possibility of a settlement or full charges and prosecution.